Meet Erica Jackson. She's a single mother trying to raise her adorable son in southern California. Not only does she struggle to provide for her son, but she's concerned about her future. Brave New Films interviewed Erica back in March about her struggles supporting her family by making only $8 an hour. The desperation and hardship readily appeared on her face. "It makes me feel like what I'm doing at work isn't enough. ... I'm just a step closer to being homeless," she said. Erica's worries aren't unfamiliar to many. Nationwide 3.6 million American workers earn at or below the federal minimum wage of $7.25 an hour. Most of these workers, disproportionately women and people of color, can barely make ends meet. Often, living on minimum wage requires many workers to pick up second or third jobs to provide for their families and continued reliance on public assistance programs. 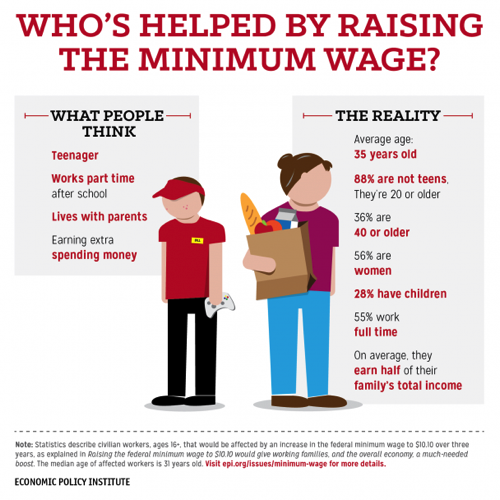 And even then, the minimum wage still keeps families living at or below the poverty line. Today, a full-time minimum-wage worker makes only about $14,500 a year, leaving many families scrambling to make ends meet and to survive. Like others who struggle on minimum wage, Erica depends on public assistance -- she receives SNAP benefits (Supplemental Nutrition Assistance Program, commonly referred to as food stamps) for her son, and her housing is provided through Section 8 housing. "It's really hard to get by," Erica said in her interview. Often, people think the worker who makes minimum wage is a teenager, who occasionally works after school and still lives with parents. The reality, however, is far more shocking. The average age of someone living off of minimum wage is 35 years old; 56 percent are women, and 28 percent have children they provide for. Currently, people across the country are calling to increase the minimum wage, with over 70 percent of Americans supporting a wage increase. This is good news to Erica and others like her. Raising the minimum wage by just 10 percent will affect poverty rates from between 1.2 and 3.7 percent, and for many households that difference is significant. "If minimum wage was just raised a dollar or two, I wouldn't need public assistance," Erica said when asked what an increased wage would mean to her. Cities and states across the country currently have initiatives on the November ballot and with low voter turnout expected, these initiatives could go either way. But, with an overwhelming majority of Americans favoring an increased minimum wage and with many economists saying increasing the minimum wage doesn't destroy business prospects, it is time we shouldn't leave these issues up to chance. In Washington, for example, the minimum wage will increase to $9.47 an hour in 2015, ranking it the highest minimum wage in the nation. But, the minimum wage increase hasn't had a negative impact on unemployment.